The original Orient Express passenger train has been re-created in all its glory for you to enjoy today. The Venice Simplon-Orient-Express has become perhaps the most famous train in the world & is a must for any serious traveller – Celebrate a special anniversary or birthday in style. Despite the painstaking renovation of vintage carriages, guests can still rely on the highest levels of personal service and outstanding cuisine. Relax in the civilised bar carriage and meet other like-minded travellers. Take a UK day trip aboard the Northern Belle or the Belmond British Pullman and enjoy the same glorious luxury vintage carriages and lovingly prepared food – all provided with the exacting standards of the Venice Simplon-Orient-Express. Current Venice Simplon-Orient-Express destinations are London, Venice, Verona, Istanbul, Vienna, Budapest, Berlin and Prague. Find out more about the Venice Simplon-Orient-Express Train, including cabin configurations, dining carriages, the bar car, the champagne bar and the colourful history surrounding the most famous train in the World. Including the brand new Grand Suite upgrade complete with en-suite facilities. Available for the first time in March 2018, the Grand Suites offer the ultimate way to complete these iconic journeys. Double Cabin Suites consist of two interconnecting double cabins. You can choose between single beds or keep one cabin as a lounge, with upper and lower beds in the other. 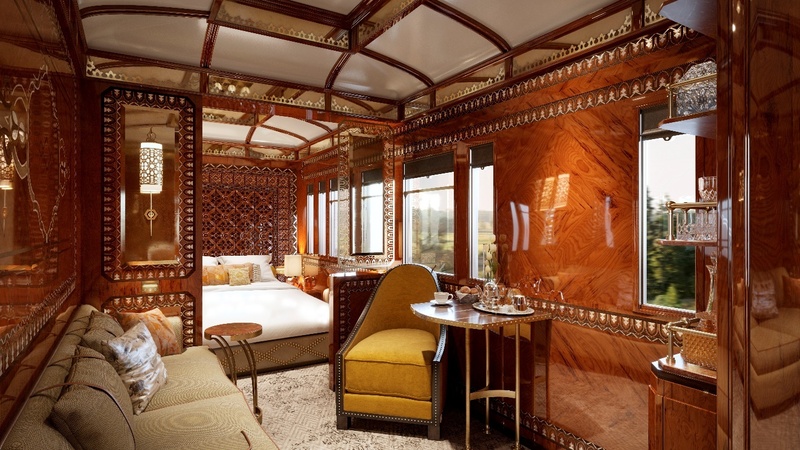 The Venice Simplon-Orient-Express train is quite unlike anything you will ever experience… Relax in an opulent cabin while a dedicated steward attends to your every need as you travel in a style reminiscent of bygone times. During the day each Double Cabin is configured as a lounge with a banquette sofa, footstool, small table and a washbasin cabinet with hot and cold water. At night, the banquette converts into upper and lower berths while you enjoy dinner in on of the restaurant cars. There are a strictly limited amount of single cabins available on board which allow the solo traveller to travel at no extra cost. It is occasionally possible to combine adjoining single cabins into a single cabin suite for the same total cost as one double cabin. Find Out More, including sample menus from the Venice Simplon-Orient-Express. Guests are accommodated over 2 sittings – the evening meals are scheduled at 18:00 and 21:00. If you are travelling London to Paris, you must take the earlier sitting. Guests joining at Paris enjoy the 21:00 dining time. The maître d’ will automatically schedule your meals to experience all the carriages. Should you have a particular preference, a particular dining carriage can be requested for each meal. Enjoy a pre-dinner cocktail in the train’s bar car complete with pianist! Enjoy a pre-dinner cocktail on board the train and soak up the unique atmosphere in the bar car complete with a baby grand piano! Let the head mixologist, Walter Nisi, create a cocktail for you to enjoy including the “Guilty Twelve” which is a secret combination of eleven spirits plus champagne invented by Walter to celebrate the 12 characters in Agatha Christie’s famous book – Murder on the Orient Express. You can also head to the champagne bar to enjoy a glass or two from a selection of chilled vintage Champagnes. After dinner, return to the bar car where the convivial atmosphere continues until the very last client call it a night. The after-dinner cocktail of choice is the Pousse Café du Train. The Bar Car (3674) was built in France in 1931 and based at the Gare Saint-Lazare in Paris. After the war it ran as part of the Sud Express from Paris to Irún on the Spanish border and from Paris to Toulouse in Le Capitole. Today it boasts a beautiful, Art Nouveau-style interior by Gérard Gallet and even manages to incorporate a baby grand piano within the carriage. Find Out More about this iconic journey. The Venice Simplon-Orient-Express must surely be the most publicised, televised and photographed train in human history. A fantastic look at the iconic London to Venice trip including life behind the scenes following the train staff. Find Out More about the origins of this train.